The shortcomings of the standard RepRap extruder have been moaned about (with some justification) on the forums and elsewhere. 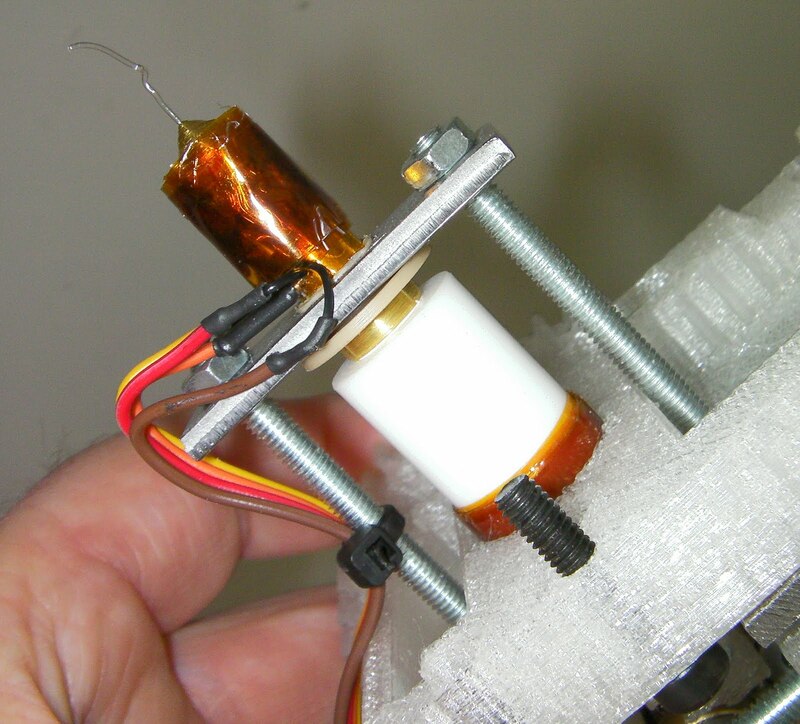 The PTFE barrel is in tension with the full force of the driven filament. 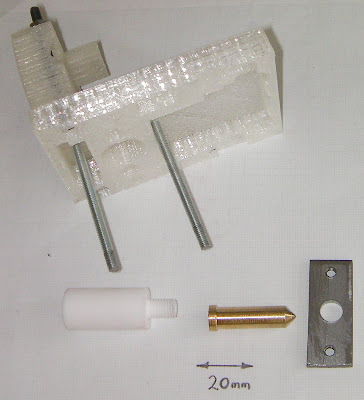 It expands when hot, altering the Z=0 point, and it has the brass extruder nozzle screwed into it; this can tend to come undone, plus the working pressure tends to force the extruded polymer down the thread making and enlarging a gap between the brass and the PTFE. I have just designed a new one that attempts to combine the benefits of the original design, the very robust Bits from Bytes design, and a number of Nophead's ideas. There is still a brass barrel and a PTFE insulator. But the PTFE screws inside the brass, so the internal pressure tends to seal the join, rather than opening it up. In addition, all the force is taken by a plate and two pieces of M4 threaded rod, rather than the PTFE. This means that the device keeps its Z=0 point. Not counting M4 nuts, it has six parts (there's a PEEK top-hat separator between the plate and the brass - you can see that in the top picture, but not in the exploded view). Final advantages are that it's much easier to take apart and to put back together, and you don't have to wait for glue to set before using it. All details will be here on the wiki soon. ...and a little bit like this one resp. this one. Is it structurally sound in the y direction? with only two contact points, it looks very strong in X, but is it prone to bend if moving Y? I suspect that as long as the PEEK/PTFE surfaces are flat, then it won't wobble too much. Very similar to maker-bot design, and there are no real issues with failure because of motion. Looking forward to seeing more on this.. Have you found that the PEEK top hat does a good enough job of insulating heat that the plate and bolts holding it up don't act as a heat sink that could soften/melt the PLA that it's mounted to above?